Effects of Forage Feeding on Milk: Bioactive Compounds and Flavor collates the research related to biologically active compounds associated with chain fresh/preserved temperate forages, the dairy animal, and cow´s, goat´s, and ewe´s milk and milk products. Comprised of six chapters, this book begins by presenting a brief overview of components of the chain – the forage, the milking animal, and milk. The book then addresses desirable and detrimental compounds by providing an expansive description of each compound’s chemical nature, methods of analytical determination, biological properties and effects on humans, factors affecting level in forage, effects of ensiling and haymaking, processes within the animal, content in milk and milk products, and health evaluation. The book also outlines volatiles affecting the flavor of milk and milk products, and includes a conclusion and numerous relevant references for further reading. Professor Pavel Kalač has been researching several topics of food and feed chemistry for over 40 years.He earned an MSc in Chemistry in 1965, and a PhD in Technical Sciences in 1979, both from the University of Chemistry and Technology, Prague, Czech Republic. Since 1971, he has been a member of the Faculty of Agriculture, Department of Applied Chemistry, University of South Bohemia, České Budějovice, Czech Republic, where he has been professor in agricultural chemistry since 1999. Prof. Kalač’s research has focused on biologically active natural compounds, both desirable and detrimental for human health, at the interface of agriculture and food. He has published numerous articles and reviews in international journals. Expanding information particularly during the last decade encouraged him to gather knowledge in book format. His book Edible Mushrooms: Chemical Composition and Nutritional Value was published by Elsevier in 2016. 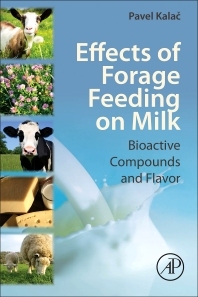 In his most recent book, Effects of Forage Feeding on Milk: Bioactive Compounds and Flavor, he collates dispersed knowledge on the occurrence of several bioactive constituents in milk as affected by various forages. Professor, Department of Applied Chemistry, University of South Bohemia, České Budějovice, Czech Republic.